The 10th printing of the AD&D Players Handbook featured a new cover, replacing Dave Trampier's illustration with a new one by Jeff Easley. This cover was introduced as part of a revamp of the graphical look of the entire AD&D line in 1983. All of the books (with the exception of the Fiend Folio, which Gary Gygax, among others, considered to be an inferior book, possibly explaining the lack of an update) were given new covers, an orange spine, and updated logos. In addition, Deities & Demigods was renamed Legends & Lore. The interiors of all the books were identical to the older printings, right down to listing the wrong cover artists, an error corrected in subsequent printings. The Monster Manual II was the only book in the revamped line whose interior was actually different in style from that of earlier printings, since it was the first new AD&D from the pen of Gary Gygax since 1979's Dungeon Masters Guide. The MMII is noteworthy as well, because it's almost entirely illustrated by "second generation" artists, like Jim Holloway and Larry Elmore. Dave Sutherland has a few illustrations in the book, most notably the polyhedral modrons, creatures that are in my opinion a lightning rod for the generation wars in D&D fandom. 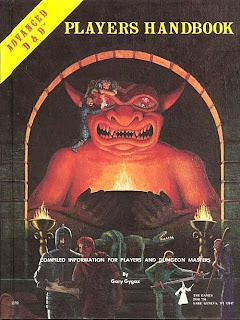 Easley's PHB cover is a fine example of the "technically well done but soulless" style of art that has come to be the mainstay of gaming art since the early to mid-80s. The revised cover is certainly more "dynamic" than Trampier's original. The profusely bearded wizard is engaged in magical pyrotechnics against imps or gargoyles or some other type of winged monster, but this battle takes place nowhere. There's no real context to it or suggestion of an outside world. There are some billowing clouds or smoke that obscure everything except the wizard and his opponents. I suppose one could argue that it's a different instance of the "points of color sparkling in the shadows" I see in the Trampier cover, but that seems like a bit of a stretch here. To me, the Easley cover is simply uninterested in anything beyond the immediate action it illustrates. In this respect, the cover is strongly character focused. What is important is the character of the wizard and what he specifically is doing. In part, that's of necessity, as there is nothing else on which to focus. The cover is not a wrap-around one. The book cover is just promotional text, like all the revised covers. The wizard himself is still an old school one. He's an old white male, with a ridiculously long beard. He's not wearing a pointy hat or a robe decorated with stars and moons, but he is dressed in flowing robes, complete with a stiff backed collar right out of the Dr. Strange school of magic. But he's not in an old school illustration at all. He's not quite in the full "strike a pose" mode of Larry Elmore or later artists, but his appearance is definitely an atavism, a throwback to an older style of illustration that was passing from the covers of game books. One of the other really fascinating things about this cover is its logo. The original AD&D books didn't really have logos. The words "Advanced D&D" were included only as small yellow banner in the upper left hand corner, using the same "olde time" font as the OD&D books. This suggests to me that TSR assumed that the vast majority of potential buyers of the AD&D books would be familiar with OD&D or at least didn't need to be sold of the game, because they already knew about it. The revised cover, on the other hand, has a full fledged logo, complete with a fire-breathing dragon doing double duty as an ampersand. There's also the word "official" in front of the words "Advanced Dungeons & Dragons," another telling change about the corporate culture of TSR and how far the industry had move from its hobbyist roots. All in all, the revised cover of the Players Handbook is not a terrible piece of art, but neither is it very good. It's certainly several steps removed from the traditions of the old school, with just a small iconographic toehold in the past. As a representation of what D&D is supposed to be, it's frankly terrible. It's much too focused on a single individual and his kewl powerz, a trend that has been continued and extended in years since. Combined with the new graphic design and logo, though, you can see the transformation of D&D from a hobby activity to a brand, another trend that, while inevitable, was unfortunate. I want to start talking about the art of D&D: what I like and don't like and why. I'll preface this entry by saying that everything you'll read here and in subsequent entries on the topic is purely subjective. That's not the same thing as saying it's arbitrary or irrational -- quite the contrary! What I hope to do in these entries is explain at some length what works for me art-wise and what doesn't and my reasons for feeling this way. I don't expect that I'll convince anyone, either die-hard fans of certain types of old school art or lovers of new-fangled illustrations. However, I do hope I'll be able to explain where I'm coming from and why certain kinds of art, both old and new, leave me cold and strike me as inappropriate for D&D. My original intention was to write a length paean to Dave Trampier, who, for me, pretty much sums up everything I think D&D art should be. So, I went around the internet, looking for scans of his art, which I was going to post here, with some commentary on why this or that piece was so remarkable. In the end, though, I realized it was unnecessary, because just about everything I could say about Tramp and his art was summed up in what I hold to be the single best piece of D&D art ever created -- the Advanced Dungeons & Dragons Players Handbook. Context: The illustration clearly takes place within a structure of some sort. You can see the brick archway that frames the demonic idol. The presence of braziers suggests it's underground or at least very dark here. The ceiling is high enough that you can't see it in the illustration. In short, it's a "dungeon," in the broadest sense of the term, which is to say, the scene depicted takes place in a lair of evil. How do I know it's a lair of evil? Take a look at that leering idol's face and tell me he's a nice guy who's just misunderstood. The idol is even holding a large bowl from which flames are emanating. That reminds me of Moloch or Baal or any of a number of Near Eastern deities who demanded human sacrifice, which, by my lights, is evil. D&D is about fighting evil in its very lair. Context, Part 2: The adventuring party you see on the cover consists of at least 11 people, if you count the six figures on the front cover and the five on the back. Some of them are almost certainly henchmen or hirelings rather than PCs. We're seeing them after they've just sent a bunch of lizard men or troglodytes to their doom. We know this because we see the bloody, dead bodies of these monsters piled up in front of the blasphemous idol. On the back cover, you see a guy dragging a dead body -- by the tail -- across the ground to get him out of the way of some other guys who are toting crates (of loot, no doubt) and rolling a barrel. Another guy is guarding a partially opened door, on the lookout for more lizard men. You see a fighter wiping the blood from his sword, while two other fellows confer over a map, and an aged wizard offers sage advice. In short, this is a carefully planned expedition into the darkness. D&D is about planning. Context, Part 3: These aren't necessarily heroes. They may be heroes, at least some of them, but they don't seem to be motivated solely by altruism. The two thieves prying the gems from the demonic idols eyes are looking down on their companions as if they hope no one notices their theft. And I already mentioned the guys carrying crates and barrels full of stuff. Getting rich is important to these adventurers. Loot motivates them to some degree and not just because they get experience points based on its gold piece value. PCs are as often venal mercenaries as they are selfless paragons. D&D is a game equally about heroes and antiheroes. "Realism:" No, of course, the scene depicted by Trampier isn't something that could happen in the real world. No, D&D doesn't even come close to simulate reality on almost any level. Nevertheless, the illustration includes lots of little details and nods to reality that help ground it in a grim and gritty world. The armor depicted looks like it would actually protect its wearers. The hirelings have a rough and tumble look about them, with shaggy hair and beards. They look like guys who'd think heading down into the depths for an extended period of time would be a good way to turn a gold piece. For that matter, none of them look like Hollywood actors or men with access to Nautilus machines. They look like real people, right down to their less than handsome mugs. There's blood on the lizard men corpses and the braziers were left burning because otherwise the chamber would be dark. D&D may be fantasy but it's based on reality. A Wider World: The scene elicits questions. Who is depicted by that idol? Are those in fact lizard men? What's beyond that half-open door? Where is this place? And so on. Trampier is showing a part of a wider world. This darkened chamber exists somewhere and not just in the sense that any illustration of a single room implies a large structure. No, we see parts of the wider world -- the room beyond the door, for example. We also see the two adventurers with a map that presumably describes more of the complex. Likewise, the angle at which we see the scene implies that there's more "behind" us, the viewers, that isn't illustrated. D&D is a game about more than dungeons. Color: Look at the colors used in this piece. They're all dark or muted, with only a few bright colors to illuminate the darkness. That's a powerful metaphor right there. D&D is not a Technicolor fantasy. Its action takes place in the darkness, the night, the back alleys of thief-ridden cities, in musty tombs, and hidden ruins. D&D is a game about points of color sparkling in the shadows. I could go on, but I hope I've started to make myself clear. Dave Trampier's art encapsulates all that I expect out of D&D and does as good a job as any to show off its most important characteristics. For me, the game will always be a quasi-gritty sword & sorcery one, based on reality but not bounded by it. Adventurers aren't heroes by profession, though they may become such over time. Or not. They are brave or at least foolhardy enough to think that mounting an expedition into an evil and monster-infested darkened hole in the ground is preferable to staying on the farm or in the shop. Trampier's Players Handbook covers illustrates all this and more. This is just the first stage is trying to articulate what I like and don't like about fantasy gaming art. The next stage will be an examination of the covers of all subsequent PHB art and why it either succeeds or fails in achieving the same degree of perfection that Tramp's cover does. My namesake over at Lamentations of the Flame Princess has issued a challenge to "name the primary influences in your personal game, so we get a flavor not of what set of rules you decide to use, but what kind of game people can expect to play with you!" I think this is a really excellent idea. One of the problems with many gaming blogs nowadays, this one included, is that they're too theoretical. There's not enough discussion of playing these games we all love so much. Don't get me wrong: I think theory is very important and I think (obviously) the history of the hobby is even more important. At the same time, we are talking about entertainments here and philosophizing about games without actually playing them is about as pointlessly decadent as I can imagine. No wonder Howard thought civilization made us soft and weak. So, without further ado, here's a listing of the media that have had the most influence on the games I run. 1. Jack Vance's The Dying Earth series: I'd say that Vance is probably the single biggest influence on me nowadays, particular the original book and The Eyes of the Overworld (I wasn't very fond of the Rhialto the Marvelous). There are a couple of reasons for this. Firstly, the books are very much in the pulp fantasy tradition. However, Vance ably modified the tradition, giving us wizards who did more than just brood in crumbling towers but who were roguish adventurers seeking gold and glory as well as knowledge. At the same time, these stories don't shy away from the notion that magic -- and knowledge generally -- comes with a cost, often a high one and it's this dark interpretation of wizardry that I find very appealing. Secondly, Vance is a terrific wordsmith, with a remarkable talent for creating a sense of the eldritch and otherworldly, mixed in with wry humor. I try very hard to create a similar atmosphere and humor is an important part of my campaigns. 2. 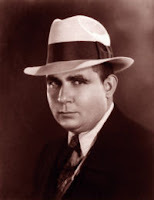 Robert E. Howard: I'm a big fan of Howard's writings and especially of his Hyborian Age, which I have come to see as the perfect gaming setting and a model for anyone hoping to create their own swords & sorcery world. Put simply, Howard knew how to spin a good yarn. His supporting characters and antagonists are not always very well fleshed out (though they often are), but the central plots of his stories are almost uniformly engaging. Like the Hyborian Age, they're good models for how to spin dross into gold. It's that talent that I've tried to learn and employ in my own games. and they share with Vance a sardonic and sometimes bawdy humor that is a necessary leaven for the general darkness of his setting. I'm actually fairly uncomfortable with bawdiness, so such things rarely appear in my games, but I have to admit that I wish it were otherwise, not because I want to appeal to my inner 15 year-old, but because I think it's an integral part of pulp fantasy. I look to Leiber for inspiration in this regard, even though I haven't yet figured out how to incorporate this genre element into my own games in a way that feels suitable as my element rather than someone else's. 4. Clark Ashton Smith: Smith is one of my favorite authors. I am very fond of his Averoigne and Zothique cycles, both of which combine romanticism, melancholy, and dark humor to amazing effect. As I get older, I find my love for Smith grows more and more and, though subtle, many of his themes, particularly laments for the past, have started to find their way into my games. 5. Westerns: The Western is the quintessential American myth, so it's little wonder that it has had an influence over the development of fantasy roleplaying. The idea of a party of rootless wanderers who defend civilization despite the fact -- or perhaps because -- they cannot be a part of it is a powerful one. The "necessary barbarian" embodied in the gunslinger archetype is the default for many campaigns and it's certainly one to which I turn again and again. Conan, of course, was such a character and Howard's "Beyond the Black River" is a Western in everything but name. 6. H.P. Lovecraft: I'm a huge Lovecraft geek and I've been known to say that I think he'd have met with more success as a writer if he'd have used his Cthulhu Mythos as the basis for pulp fantasies than for modern day weird tales. I know very well why Lovecraft didn't do this, but I can't shake the feeling that the combination of sword & sorcery and eldritch horror is a winning one. So, while I call Lovecraft an influence, most of what I take from him is his skill at creating ancient terrors and Things Man Was Not Meant to Know. I'm not sure anything I've ever done in my games is truly Lovecraftian in an academic sense, but he was often in the back of my mind and I must acknowledge that debt. 7. Gary Gygax: I would be remiss if I didn't list the Dungeon Master himself as an influence on my games. There's really no way to judge how large Gary looms in my imagination and almost all of the influences I've already listed are things I discovered because of him and the glorious Appendix N of the AD&D Dungeon Masters Guide. My games are full of Gygaxian flourishes, from names to quasi-historical pedantry to gleeful theft of any idea adaptable to fantasy no matter what its origin. And of course Gygax taught me how to have fun with RPGs, a lesson I hope everyone of my games has taken to heart. I'll have the first of several posts about art later. I'll have some more extensive thoughts on old school art soon (perhaps later today), but in the meantime, enjoy this darkly cruel piece of Jeff Dee art from the Rogues Gallery. Over at Monsters and Manuals, there's a pretty good rant that touches on the question of old school art and its relevance to contemporary gaming products. I don't agree with it all, but there's much there with which I sympathize. As I noted in the comments to yesterday's review, though, I'm still grappling with the precise nature of my problems with a lot of neo-old school art and why I want something different. So, please bear with me on this question. Right now, I'm mostly at the instinctual, "That ain't right" phase of plumbing my esthetic sensibilities. I can't quite put into words why I dislike much of what I've seen in old school gaming products without sounding like I'm just being arbitrary -- which I may in fact be. At this stage, I can only say that I think there must be room for something in between the aping of the past and the total rejection of it. I realize that's not very helpful, which is why I haven't taken much time to talk about what I do want and do like on the art front. I'm going to have to do some thinking on the subject, though, and see what I can come up with. I talk too often about my reaction to neo-old school art to be able to get away with not having a positive explanation for what I do like and why. So, give me a couple of days and I'll get around to the subject. I'm off to get some other work done, but I'll likely be back later with some thoughts on one or two other subjects later today. Much wisdom over at Retro-Roleplaying. Read and learn. 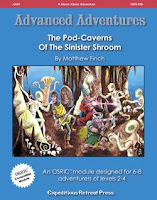 The Pod-Caverns of the Sinister Shroom, written by Matthew Finch, co-creator of OSRIC and the driving force behind Swords & Wizardry, is the first adventure produced by Expeditious Retreat Press for use with OSRIC. Unless I am mistaken, this module may have been the first commercially available OSRIC product at all. At the very least, it was the first one of which I ever heard and, in many ways, sets the standard for OSRIC support products, both in terms of its quality and, perhaps more importantly, its content. In this respect, I think it makes a nice counterpoint to the previously-reviewed Monsters of Myth, another product written with the involvement of OSRIC's creators and whose quality and content revealed the possibilities and pitfalls of the retro-clone movement. The Pod-Caverns is a 16-page adventure module designed for 6-8 characters of levels 2-4. Its presentation is, unsurprisingly, very similar to that of the TSR AD&D modules released in the late 70s and early 80s. Even the interior layout mimics its predecessors, right down to the fonts. On some level, I have to admit that this simultaneously irked and thrilled me -- thrilled because, reading it, I was often reminded of how much I loved TSR's modules and irked because I don't think old school products must look like they were made 25 years ago. Interestingly, the maps included with the module are not collected on the interior covers of the module nor are they done in the "blueprint" style grognards associate with the Golden Age of Gaming. Personally, I had no objection to this and found myself wishing the layout were similarly "radical." The module's interior artwork (also by Matthew Finch) is black and white and sparse, again mimicking the classic modules of old. However, Finch's artwork didn't irk me in the way that the layout sometimes did, because he wasn't aping the style of an old TSR artist. Instead, his illustrations were done in his own style and that's exactly what I wish we saw more of in old school products. I noted in an earlier entry that what annoys me most about modern gaming products is not necessarily the style of the artists who illustrate them, since I quite like many contemporary gaming artists. What annoys me is that game lines have too much art direction, resulting in a bland, evenness that simply doesn't spark my imagination. For all the technical infelicities of older gaming art, it was at least diverse and, for me, that's an essential element of good gaming art. Finch's illustrations are his own and, aside from being evocative, are unlike any other gaming artist, which is a huge positive to my mind. The cover illustration by Stefan Poag is decent, but veers a bit too much toward being imitative rather than simply expressive. I did, however, appreciate seeing a magic-user in a pointy hat and a fighter wearing a full suit of chainmail -- with coif! -- engaging in battle against some pod-men. The module itself is true to its name, being primarily a three-level subterranean adventure locale with very little context beyond whatever the referee provides. There is a thin thread of a plot, involving the titular villain's machinations against the surface world, but the vast majority of the encounters do not hinge on it. Depending on one's own proclivities, The Pod-Caverns will thus read either as "bland" or as "open-ended." I myself found the latter adjective more apt, so much so that I was tempted, this past weekend, to insert The Pod-Caverns into an old school pick-up game set in the Wilderlands I ran with some friends. The module assumes that the referee will use it in one of two ways: the site of a frontal assault by adventurers from the surface or as an obstacle for subterranean explorers seeking to find their way back to the surface. The encounters in the module are nicely diverse and challenging for their level. There is a good mix of monsters, including many fungi, plants, and plant-like creatures, as one would expect, interspersed with traps, tricks, and other impediments. There are also plenty of enigmas as well, by which I mean encounters that are suggestive of a wider "story" without tying the referee's hands should he wish to take one of them in a direction not intended by the author (or not take them up at all). Again, the lack of explanation may prove a source of consternation for some. There is, to cite one example, a ghast trapped inside a pillar "for centuries" but there is no explanation as to how or why this imprisonment occurred or why a certain method will release him from the pillar. This approach epitomizes the old school philosophy, though: present the "facts" of the adventure locale and let the referee decide on their meaning, if any. All in all, I found The Pod-Caverns of the Sinister Shroom very evocative and, at times, downright creepy, but then I've long felt fungi were disturbing and this module nicely plays on those fears in a way that reminds me of the best modules of days gone by. If I have a complaint about The Pod-Caverns it is about its production values. Don't get me wrong: the module is well made and presented. However, I fear that the layout and trade dress go beyond homage to the past and verge on fetishization. Granted, the module was almost certainly written to appeal exclusively to grognards and I can't deny that reading it frequently transported me back to the summer of 1980, when playing AD&D with my friends formed my primary source of entertainment. Nevertheless, I think this exclusivity, whether conscious or not, is unfortunate, because The Pod-Caverns is a terrific example of an old school module and it's highly unlikely that anyone except dyed in the wool old schoolers will ever read it. We already know what old school means and is all about; it's the younger generation that doesn't understand and I just don't see them going into their local gaming store and picking this module up. I say that with some considerable regret, as this is a finely crafted piece of work that deserves to be better known and appreciated. I continue to believe that a worthwhile experiment would be for someone to release an old school product that doesn't ape the presentation of the past but instead employs more contemporary media. I'm not talking about the ludicrous "dungeonpunk" of 3e or the over the top action of 4e. I'm also not suggesting the use of anime/manga esthetics or indeed anything that would smack of a video game. However, I think there's a world of difference between these things and getting away from doing faux Sutherland, Trampier, and Otus drawings, never mind a layout that's not just two-column text in a bland sans serif font. The fact is that there have been advances in the realm of game presentation and illustration, even if game content may well have degenerated or at least changed in unhealthy ways. For me, a marriage between modern graphic design and traditional content would be ideal and I can't help but think that gems like The Pod-Caverns of the Sinister Shroom could achieve wider recognition and success if they were presented in a way that didn't scream "nostalgia piece." I know this makes me a heretic in many old school circles, but so be it. There are some truly excellent old school products out there nowadays and we grognards have no one to blame but ourselves that they aren't better known and appreciated. I think I've mentioned before that my introduction to gaming was through a childhood friend's older brother. He was a metalhead teenager and he was my first Dungeon Master. Consequently, a lot of my early gaming prejudices and idiosyncrasies were inherited from him and his circle of friends. One of those prejudices was a dismissal of David Hargrave's Arduin Grimoire series as being beneath the "serious" gamer. At that time, the Arduin series consisted of three volumes (the Arduin Trilogy, as they've become known) that were the same size, color, and general format as the three little brown books of OD&D. This was not a coincidence. Starting with the first volume in 1977, it's clear that the Arduin books were Hargrave's hacks to OD&D, a fact not lost on TSR, which issued a cease and desist order because the books used D&D-related trademarks without permission (or so I am led to understand). Bear in mind that, at the time, I was young and not at all plugged in to the wider gaming community. I never knew exactly why Arduin and Hargrave were treated by some as the Second Coming and by others as the Antichrist. I saw ads for the Arduin books in Dragon and other gaming publications. I saw references to the books and heard my elders in the hobby speak of them in somewhat hushed tones. However, I never actually saw the books myself. When I inquired about them, I was informed by my friend's brother that they weren't worth my time. They were "silly" and "unbalanced" and "Monty Haul" and this judgment was enough for me to cease my delving into Things Man Was Not Meant to Know. I'd honestly forgotten about the Arduin Trilogy into fairly recently, when my love affair with OD&D was reignited. What I discovered was that a great many people whose opinions I'd come to respect, such as Jeff Rients, for example, thought very highly of the books, going so far as to declare them among the best old school gaming products ever written. At the same time, there were naysayers. I could hear the voice of my friend's brother whispering in my ears, reminding me not to walk the path of the Dark Side. But I'd learned that many of the things I'd taken to be true from my youth weren't necessarily so, at least as far as gaming goes. So I screwed up my courage and ordered copies of the original Arduin Trilogy. They arrived two weeks ago and I've been reading them ever since. What I found was a bit of a disappointment, on numerous levels. There was nothing "subversive" about the books at all. Indeed, I found myself bored at times. The books were certainly old school: no concerns about balance, verisimilitude, or even logic, amateurishly produced (though some of the art was quite good, far better than anything in OD&D), and positively in love with random tables of all sorts. None of it clicked with me, though. There were individual bits and pieces I found intriguing (the experience rules, for example) and some that made me reconsider long-held opinions (on the mixing of genres, for instance), but most of it generated a resounding "meh" from me. I realize that, on some level, the impact of Arduin can't really be judged adequately thirty years after the fact. At the time these books were published, the ideas contained within their covers were new and original and a little bit subversive. Why else would so many people back then have made a point of dismissing them? Now, though, Hargrave's best ideas seem pedestrian while his wilder stuff strikes me as silly. I'm reminded of my experience seeing reruns of the TV show "Laugh-In" for first time. My parents had always spoken of how funny the show was and, more importantly, how "naughty." So I expected it to be this uproarious, boundary-pushing comedy extravaganza -- and it wasn't. It was boring and often just plain stupid. But I was watching it in the 1980s, decades after comedy had changed, in no small part due to the influence of "Laugh-In" and so it was impossible for me to view the show with the eyes of my parents, who grew up in a pre-"Laugh-In" world of comedy. In much the same way, I entered gaming in a post-Arduin world and so its impact is very hard for me to see and appreciate. I started playing in late 1979, by which point Arduin had already made its big splash. Many of its better ideas were readily accepted and incorporated into gaming, while its more outlandish and/or outré ones became those that became "quintessentially Arduin." Its those things that my friend's older brother objected to and that formed a significant portion of the opposition to Arduin. Reading it in 2008, even those outlandish things strike me as banal. We've had 30 years of people trying their damnedest to push the boundaries of gaming, some of them even successfully. Consequently, it's nearly impossible to read the Arduin Trilogy now and see any of its ideas as original as they once were. I feel bad about that, because I'm constitutionally predisposed to giving people their proper due. Whatever else he was, David Hargrave was a very imaginative guy and, by all accounts, an amazingly agile referee. That he's not more well known is a shame, because he certainly influenced the development of the hobby in numerous ways, probably more than even I realize. I'm glad I bought and finally read the Arduin books. I feel as if a hole in my gaming education has been filled. I can't honestly say I'm ever likely to use anything from these books, nor can I say that I find them inspirational in the way that I find, say, many early Judges Guild products. Arduin feels very dated to me; these are not timeless books. They're important historically but only historically. Bits and pieces of Arduin have certainly had their influence (D&D's thri-kreen are almost certainly knock-offs of the phraints) and Encounter Critical strikes me as a loving homage to gonzo silliness of Arduin (being first "published" in the same year), but I'm hesitant to say Arduin is "important" without qualification. Arduin represents a part of the old school heritage that I have a hard time connecting to, so perhaps I am biased in my estimation of its virtues. I know that many people see it as a gleeful, glorious romp filled with boundless imagination, whereas I find most of it ridiculous. That said, I certainly don't think Arduin should be kicked from the clubhouse. However, you can be sure I myself won't be inviting it over to dinner anytime soon. Fortunately, Arduin has enough admirers among us grognards that it won't starve for affection nor will it pine away for lack of mine. As he often does, S. John Ross speaks great wisdom in his "Five Elements of Commercial Appeal in RPG Design." Yesterday, the Game System License for the new edition of Dungeons & Dragons was released. I honestly didn't think we'd ever see one, as I predicted earlier. So, let the pillorying begin: I was wrong about this. In my defense, though, I stand by the fact that 4e is not an open game. The GSL is not an open license but instead a limited use trademark license. And now that we can see the license itself, we can see just how limited use it actually is. Lots of people better versed in the intricacies of legalese than I have already dissected the GSL and found it wanting. Even Clark Peterson of Necromancer Games, one of the biggest boosters of 4e, seems to have had the wind taken out of his sails by the GSL. The long and short of it is that the GSL, far moreso than the OGL, is designed to sell copies of WotC-produced D&D products. It is not about expanding "network externalities" or growing the hobby or anything else beyond making WotC money. Now, that's WotC's prerogative, of course. They are under no obligation to anyone, except Hasbro's shareholders, to do anything, least of all give away their intellectual property for free for others to use to produce their own products. So let there be no mistake: I don't think WotC has done anything wrong with the GSL. But I do think the restrictiveness and narrow-mindedness of the GSL serve to highlight just how revolutionary than OGL was (and is). Apparently, the guys in charge of WotC agree and they're launching a counter-revolution in the form of the GSL. Assuming anyone still places any faith in my predictive abilities, I will now make two further prognostications. First, I think we will see very few non-PDF publishers use the GSL. Instead, almost all 4e support will be done through separate licensing agreements, a possibility even the GSL notes as an option. Second, I think Paizo's Pathfinder RPG will now become a much more powerful force in fantasy gaming. No, it won't be a serious rival to D&D in terms of numbers or profit, but it will do very well for Paizo, far better than they were expecting and it will quickly rise to be the linchpin of the remnant OGL hobby/industry. In between all the other things I'm reading -- or should be doing instead -- I've been immersed in my various collections of Conan stories. In reading them, I've come to the conclusion that the Hyborian Age is about as perfect an example of a fantasy roleplaying game setting as you can get. It has the feel of history without the necessity for knowing any history at all. And of course, by "history" I mean "cool history." The world of Conan is like all the cool places in which you'd want to adventure mashed together cheek by jowl. Not only does this mean that your high chivalric knight can go exploring the Tomb of the Lost Pharaoh, it also means that his companions can be a Viking skald, a Mongol raider, and a priestess of Aphrodite. What's better than that? When I was a younger man, I used to get hung up on making things as historically accurate as I could. So, if my campaign setting was a high medieval one in character, I didn't even allow Vikings, because they were from an earlier period of history. Likewise, my Egypt analog wouldn't be peopled by bald hieroglyphics-carving worshipers of Ra but by more "plausible" Arab stand-ins. Nowadays, though, I can't help but think I missed out on a lot of fun, as Two-Gun Bob understood very well. What's fun about the Conan stories is how the Cimmerian is able to wander across history, metaphorically, as he wanders across Hyboria. One story he's in what amounts to classical Greece, in another he's in medieval France, and in a third he's among a bunch of Aztecs slapped into the middle of a faux Africa. That gave Howard an opportunity to tell a wide variety of stories that drew on a vast number of pulp fantasy tropes -- and keep them fresh. No, much of it doesn't make any sociological sense, but to worry about that is to kind of miss the point, as my younger self no doubt would have. The trick to pulling this off is twofold. First, make sure your analogs are analogs. Stygia, for example, isn't Egypt. It's a lot like Egypt, but it's not identical to the historical Egypt of any single era. Instead, it's a mishmash of many different eras, combined with stuff that Howard just thought worked in the context of the stories he wanted to tell involved Stygia or Stygians. Second, and in some ways, most important of all, the mishmash can't just be a mishmash. That is, it has to have a coherence of its own. One of the reasons the Hyborian Age feels "right" is that Howard did a good job of giving the whole thing solidity, a sense that it held together without reference to the real world. He does this in a lot of different ways, from small details to off-hand references to imaginary histories he almost certainly never worked out in detail, but the combined effect is to make (to use my earlier example) Stygia simultaneously Egypt and more than Egypt. Stygia isn't just Egypt with the serial numbers filed off but rather an imaginary place that is immediately intelligible because it's enough like the pulp conception of Egypt to hook us, but also dissimilar enough to feel as it's not merely an unimaginative knock-off. This is my ideal for a pulp fantasy setting. You see similar principles to those Howard used at work in both the Wilderlands of High Fantasy and in the early World of Greyhawk. I could also argue that Paizo's Golarion setting employs the same principles and that's one of the reasons their Pathfinder RPG project continues to interest me, even if I think the end result might wind up being more complex and detail-heavy than I prefer. You get the point, I think, but let me just say one final thing on the subject and we'll go on to other things: The very essence of fantasy gaming is its total lack of limitation on the scope of play, both in its content, and in its appeal to people of all ages, races, occupations or whatever. So don't limit the game by excluding aliens or any other type of character or monster. If they don't fit what you feel is what the game is all about, don't just say, "NO! ", whittle on them a bit until they do fit. After nearly a week's absence from regular posting, I'm going to start small by pointing out a couple of blogs and a site that, while many of you are no doubt familiar with, some of you may not be. Even if every reader of this blog already knows about these places, I still feel a certain obligation to mention there here, because each, in their own way, is making invaluable contributions both toward better understanding the past and traditions of the hobby and ensuring the future of those same traditions. First is Philotomy's OD&D Musings. Philotomy is the guy who's most responsible for my return to OD&D, thanks his posts on various forums, as well as emails we exchanged last year. His website remains my favorite "explanation" of why OD&D is so enjoyable. I say "explanation" because the site isn't set up to provide formal explanations at all. Instead, it presents a collection of thoughts on various OD&D-related topics that I can't help but find incredibly inspiring. If someone asked me to describe what "old school" means, I'd point them to Philotomy's site, because it's probably the single best evocation of that slippery mode of thought that I've yet encountered. It helps too that Philotomy is a really nice fellow with the coolest nom de Web out there today. A close second is Sham's Grog 'n Blog, another infectiously inspiring website devoted to OD&D. Like Philotomy's site, it's a beautiful evocation of what old school means. Sham should be a role model for any old schooler who's looking to extend that philosophy into the 21st century. He's written a number of excellent posts that expand OD&D mechanically, simultaneously taking the game in new directions while still remaining true to its essence. His recent "What Price Glory Series" on combat is simply brilliant and his "Entourage Approach" is just as good. This is another must read site. Finally, there's Matt "Mythmere" Finch's Swords & Wizardry blog. Matt is one of the mind's behind OSRIC and he's now turned his attention to the creation and development of not one but two different OD&D-derived retro-clones -- one a "true" White Box clone and the other a "basic" version designed to be used as a Rosetta Stone system to encourage easier communication between different flavors of old school D&D. This is really exciting stuff in my opinion and I'm frankly amazed that one person has managed to do so much for the old school community. I have very high hopes for Swords & Wizardry in both its forms and I believe Matt has big plans as well. Regular posting will resume again tomorrow. I've got a huge backlog of emails and actual work I need to get finished during the coming week, but I think I regret not posting him more than anything. Yes, yes, I was sick; I have an excuse. Still, this blog has been a huge amount of fun for me and I continue to be amazed and gratified by how many people seem to enjoy what I've been writing. I've made a lot of new friends -- and reconnected with some old ones -- and, agree or disagree with what I have to say, I'm pleased that what I've put up here is getting people to talk about the history and traditions of our shared hobby. So, expect the usual slew of musings, opinions, and rants to return, starting tomorrow. In the meantime, Happy Father's Day. First, thanks to everyone who's expressed concern at my illness. I'm on the mend, but I still have bad cough and tire easily. I'm also a bit more melancholy and moody than is usual for me. So, posting will probably still be light till next Monday. I'm hoping the weekend will be enough to help me kick this bug and get back into the saddle again. That said, while I've been laid up in bed and generally shutting out the world, I was thinking about the history of OD&D and I realized that, within about a year of its release, the game developed a split personality that's not never really healed. The first published edition of OD&D was released in January 1974 and laid the foundation for what would come. The three little brown books thus established the "core personality" of Dungeons & Dragons -- the outline of a game of fantasy adventuring grounded in both the pulp literary tradition and the wargaming scene of the late 60s/early 70s. In 1975, the modestly named Supplement I: Greyhawk appeared. While Greyhawk is self-described as "a supplement to an existing body of rules" rather than a replacement, it nevertheless did replace many elements of OD&D (Hit Dice for classes and monsters, weapon damage by type, etc.). More importantly, Greyhawk also gave the world its first taste of what I will, somewhat inaccurately, "Gygaxian naturalism" -- D&D's second personality and, over time, it's dominant one. One of the things that should strike anyone who reads the little brown books of "pure" OD&D is how bland they are. They assume the reader has a grounding on wargames and pulp fantasy by their allusions and ellipses, but the text, as written, has very little flavor of its own. In my opinion, that's one of the virtues of OD&D: the reader must engage the texts and actively make sense of them. One simply cannot read them and understand them without effort. Consequently, anyone who sincerely makes a go of playing OD&D will, of necessity, be co-creator with Gygax and Arneson in making his own fantasy adventure game. The early history of the hobby shows lots of people doing just that, which is why roleplaying went off in lots of unusual directions in those days, with individual creators inspired by this or that element and running with them as they saw fit. I think it's hard not to find those bygone days an Age of Giants, by dint of enthusiastic creativity if nothing else. Greyhawk changed all that. We now had a supplement that not only changed and expanded rules, but that gave us flavor as well. Prior to Supplement I, there were no named magic items, for example. Named spells wouldn't officially appear until AD&D, but many distinctly D&D spells, such as magic missile, would appear here. Likewise, many original-to-RPGs monsters first appear in Greyhawk. Where the three little brown books (largely) contented themselves with concepts and ideas drawn from a common store of pulp fantasy, legendry, and history, Greyhawk begins in earnest the establishment of a common D&D mythology drawn primarily from the Lake Geneva campaign co-DMed by Gary Gygax and Rob Kuntz. Though it was almost certainly not TSR's intention, the Greyhawk campaign would become the Versailles of D&D, its fashions and eccentricities being taken as normative rather than merely suggestive. I call OD&D's second personality "Gygaxian naturalism" because, as the develop of AD&D shows, Gary Gygax was quite keen that D&D should be a game that not only had its own distinctives, distinctives largely drawn from his home campaign, but that gave each DM the tools to create a whole world. Whereas OD&D has a strong (but not exclusive) emphasis on dungeon crawling, AD&D casts dungeon crawling as initiatory rites to a wider fantasy adventure experience. That's why stories of the Lake Geneva campaign are filled with tales of characters becoming mover and shakers, with holdings, henchmen, and ambitions beyond mere loot. Such activities demanded that there be a whole world out there to explore. Thus, you get discussions of the planes of existence, stats for mundane creatures, random prostitute tables, and all the rest. These things all arose, I'd wager, as part of an effort to make D&D a game that could describe a world not bounded by treasure and trap-filled catacombs -- just like the Lake Geneva campaign. None of this is to say that dungeon delving wasn't important in Greyhawk, because it was, nor is it to imply that other campaigns, such as Blackmoor, didn't have a significant "political" component, because they did. However, I think it's significant that, for example, what we know of the Blackmoor setting from Dave Arneson's First Fantasy Campaign and later products is far smaller, both in terms of geographic and topical scope, than the Greyhawk campaign. And I know from conversations with Gary before his death that there were plans to describe all the lands of Oerth after the fashion of the 1983 boxed set. His vision was a wide one, anchored in the belief that DMs needed such a breadth of information, because the player characters might wander far from the dungeon and hunt wild boars for food drink too much in a tavern and suffer the ill effects of intoxication. Even fantasy worlds need verisimilitude, at least to a degree, and Supplement I began the process of providing rules for it. All of this is a roundabout way of saying that I think there are two D&Ds, each one rooted in a different phase of OD&D. The first is a game of pure adventure, with comparatively few concerns about the wider world in which those adventures take place. The second is a game of fantasy world building, so as to establish the boundary conditions inside of which adventures can take place. 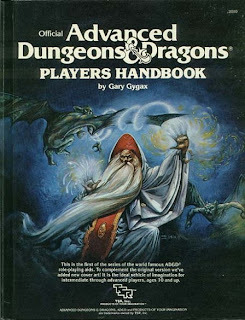 The second approach is the one that was canonized with AD&D and thus became the default one most gamers of a certain age associate with the game. Indeed, I could argue quite forcefully that, for all the claims that 2e had betrayed the Gygaxian vision, it was in fact simply an extension of Gary's own world building emphasis. The "pure adventure" line of descent survived in the Moldvay/Cook version of the game and lingered even in the Mentzer/Compendium rules (thought not supplements, which became increasingly AD&D-like over time), but it was overshadowed by the Greyhawk approach, to such an extent that "dungeon crawling" is usually a term of opprobrium among gamers, with the implication that it's a "lesser" form of D&D. I'll admit that, despite my own mechanical preference for OD&D, I am rather more in line with Gygaxian naturalism than I am with pure adventure. That said, I think a better balance between the two approaches needs to be struck, since unchecked Gygaxian naturalism was the seedbed for Dragonlance and other later developments that, in my opinion, did violence to the original presentation of the game. And now I must rest. I'll try to keep up with comments, but I can't guarantee it. I'm still very stiff and achy and have a nasty headache. But feel free to discuss things in my absence. All fled, all done, so lift me on the pyre. The feast is over, and the lamps expire. On this day in 1936, thirty year-old Robert Ervin Howard ended his life after penning the couplet above. I don't think it's an exaggeration to say that, had he lived longer, he would now be remembered in the equal of Ernest Hemingway and Jack London in the pantheon of American writers. As it is, his creations, most notably Conan, are among the most well-known in popular culture and have inspired generations of writers and dreamers of all sorts. His death is all the more sad because, by many accounts, he considered himself a failure as a writer, which couldn't have been farther from the truth. On a personal note, I've been very ill the last few days with a late Spring cold. I'm only now starting to recover, but I'm still exhausted and achy. Expect posting to be light for the next few days more, as I try to catch up with work I need to do, as well as my various other duties. "Mook" rules seem all the rage these days in roleplaying games. Even the new edition of D&D has them. I find it interesting that this is considered some sort of innovation, given that Dungeons & Dragons has had such rules since OD&D (stemming from Chainmail, I believe). Under OD&D, a fighting man can attack a number of times equal to his level when facing foes of 1 Hit Die or lower. This rule carried over into AD&D in modified form, with multiple attacks being allowed only against foes of less than 1 Hit Die. Philotomy suggests (correctly, I think) that the change occurred because a 1st-level OD&D fighting man has 1+1 (d6) Hit Dice, while a 1st-level AD&D fighter has 1 (d10) Hit Dice. In any event, it was only with 3e that this rule went away. I think that's unfortunate, because not only did it speed up combat in certain situations, but it also added powerful distinctiveness to the fighter class. Only the fighter had this ability and it helped to solidify the notion that the fighter was, as his name suggested, the melee combatant par excellence. The loss of this ability isn't the end of the world, of course, at least not any more than Greyhawk's allowing Thieves to wield magic swords, previously the sole province of the fighting man. But it's another example of the slow whittling down of the class's uniqueness in favor of "sexier" options. This is not a new phenomenon; I'm not laying the blame solely on newer games. The trend began right there in Supplement I, where the paladin is like a Fighter+ and the Thief stole the stealthy combatant role away and claimed it as its own. So, I'm actually sympathetic to the notion that the fighter needs some beefing up compared to other classes. At the same time, I'm well aware of the history behind the diminution of the fighting man and I see most modern attempts to address this as absurd hypercorrections. The fighter is a very primal, "pure" class and I'd like to see it stay that way. What it needs is not lots of mechanical bells and whistles or a role beyond its true raison d'être -- combat -- but a simple focus on making the class better a fighting, whether melee, missile, or stealth, than any other class. This vision of the fighter was lost a long time ago, but that's no excuse not to return to it. I've been greatly enjoying Northwest of Earth from Paizo's Planet Stories line of reprints. I'd never read these pulp science fiction tales before, so it's a real treat. Despite the years, they hold up remarkably well. Yes, the science is completely fanciful and would almost certainly have been fanciful even at the time they were written, but that doesn't adversely affect the fiction at all. In some ways, I think it works to the advantage of the stories. When you read them, you won't get caught up in technobabble and speculation and can just focus on the characters and situations, both of which are extremely well done and engaging. Last night, before before bed, I was reading the story "Dust of the Gods," in which Northwest Smith finds himself, once again, out of work, out of money, and almost out of booze. So he and his faithful friend, the Venusian Yarol, consider hiring themselves out a wild-eyed little Earthman whose employment has already scared off several toughs. After listening to the madman's tale, the two companions confer with one another. "Did you believe that yarn?" "Don't know -- I've come across some pretty funny things here and there. He does act half-cracked, of course, but -- well, those fellows back there certainly found something out of the ordinary, and they didn't go all the way at that." "Well, if he'll buy us a drink I say let's take the job," said Yarol. "I'd as soon be scared to death later as die of thirst now. What do you say?" "Good enough," shrugged Smith. "I'm thirsty too." With dialog like that, it's hard not to enjoy these stories. They take place in a setting that reminds me a bit of Space: 1889 except with "modern" rather than Victorian trappings. All the worlds of the solar system boast intelligent species and Earthmen have entered a dark universe whose true history they do not understand. Lurking in the background there are secrets and mysteries and things Man was not meant to know. Into this strides Northwest Smith, a latter day gunslinger, with his scarred face and no-color eyes. These stories are a terrific blend of science fiction, horror, Westerns, and the weird tale. They're great fun and it's hard not to be inspired by them. I've been thinking a little about the combat mechanics of OD&D and AD&D and the way that those rules have developed over the years, particularly in the most recent editions of the game. Two of the pillars on which D&D combat rests are Armor Class and Hit Points. Both of these are abstractions, representing not a single "real world" thing but rather a concatenation of factors that, if separated and tracked separately, would slow combat to a crawl. Consider too that both OD&D and AD&D assume a one-minute combat round (as opposed to the 10-second one first introduced in the Holmes Basic Set and used in Moldvay, Mentzer, and 3e). One minute is a very long time in melee combat. During that timeframe, even the slowest, most encumbered person could likely launch a melee attack more than once. And yet OD&D and AD&D both allow only a single 1D20 attack roll during that time period. D&D combat is thus extremely abstract; it's not intended to model individual thrusts and parries. Instead, it's the game mechanical equivalent of panels in a comic book, each attack roll being a distillation of many little offensive and defensive actions that occur over the span of a minute. The problem over the years is that referees and designers alike often forget these facts. Beginning with Supplement I in 1975, there's long been a tendency to want to "zoom in" on certain aspects of the melee round and treat them less abstractly. So you get rules for weapons vs. AC tables, hit location tables, combat maneuvers, feats, etc. -- all well-intentioned attempts to make D&D combat more "realistic," "fun," or "interesting." Now, I don't think there's anything inherently wrong with the desire to get beyond the monotony of roll-to-hit-roll-for-damage combats. But the reality is that, if you're keeping Hit Points, Armor Class, and many other staples of D&D's original abstract combat system, many, if not most, "tactical" additions make no sense whatsoever. At the very least, these additions draw attention to the fundamentally "unrealistic" nature of the system, resulting in something that, in my opinion, is far less coherent. As I said already, this is not a blow-by-blow simulation of medieval melee combat, but most tweaks to the system treat it as if it were. Given that, it seems to me that there are two possible approaches. The first is simply to embrace the abstraction and enjoy it for what it is. There's room for alterations and augmentations, of course, but they need to operate on the same level of abstraction or else the house of cards comes tumbling down. The second approach would be to revamp the combat system from the ground up, but that requires eliminating Hit Points, AC, and many other elements people associate with D&D combat. I think it could be done; whether result would be something anyone would recognize is another matter. In short, I'm always amused when people speak of D&D as having a tactical combat system, because it doesn't. As originally conceived, the system was far too abstract for tactics to matter in the way most people use that term. But then I'm increasingly convinced that the strongest "philosophical" connection D&D carried over from its wargame roots was not in the realm of tactics but in strategy. It's this conviction that partly fuels my belief that OD&D was misread by a lot of the non-wargamers who picked up the game later. You can see the results of that misreading in late 2e, if not before, and it's in full flower in 3e (and almost certainly 4e as well). Mutant Future, perhaps fittingly for a game that involves mutants, could be called the next step in the evolution of retro-clone roleplaying games. Written by Daniel Proctor and Ryan Denison, and published by Goblinoid Games, Mutant Future is not a "true" retro-clone such as Proctor's earlier Labyrinth Lord. That is, this game does not restate the rules of an earlier RPG through the use of the Open Game License, but is instead a wholly original game. That's not to say that Mutant Future isn't heavily inspired by Gamma World, particularly its 1983 second edition, because it clearly is. However, unlike D&D, no portion of Gamma World was ever released as Open Game Content, except insofar as Gamma World shared certain mechanical connections to D&D, from which its rules were partially derived. Consequently, even had Proctor and Denison wished to clone Gamma World in the way that Labyrinth Lord cloned the Moldvay/Cook Basic and Expert sets, they could not have done so legally. Thus was born Mutant Future. Mutant Future is a complete old school science fantasy roleplaying game in 162 pages. The book is laid out cleanly and is well organized and easy to read. The book is nicely illustrated throughout with black and white line art, most of which is quite good and serves to convey the slightly gonzo tone of the post-apocalyptic science fantasy genre. The only piece I didn't especially care for was the cover illustration by Jason Braun, not because of the illustration itself, which is actually quite good, but because of the coloring, which makes it appear more cartoonish than it is. The illustration reappears in black and white form on the title page and I much prefer it there. The text is clear and well edited. I noticed very few misspellings, dropped words, or other such errors. This is a very well put together book and evidence that the gap between "amateur" and "professional," at least when it comes to gaming products, is narrowing with each passing year. The rules of Mutant Future derive from Labyrinth Lord and I think this was a wise decision for numerous reason. Firstly, LL's rules are simple, straightforward, and well constructed. Mutant Future benefits immensely from being able to draw on the mechanical solidity of its predecessor. Secondly, this ensures compatibility between the two games and promotes cross-pollination. One of the characteristics of old school gaming is its willingness to blur the boundaries between genres. Mutant Future, like Gamma World before it, labels itself as a science fantasy RPG, not a science fiction one. In part, that's because its fanciful treatment of radiation and mutation wouldn't stand up to scientific scrutiny, but it's also because both games arise out of a long pulp tradition that treated fantasy as inherently post-apocalyptic. Howard's Hyborian Age, after all, exists in the wake of the fall of Atlantis. While Conan fights no mutants, the world he trod under his sandaled feet is thematically a close cousin to that of many post-apocalyptic settings. And of course the AD&D Dungeon Masters Guide famously included conversion rules for Gamma World, so there is plenty of precedent for mixing and matching between the two genres. With Mutant Future, conversions will be almost seamless, as there are far fewer differences between it and Labyrinth Lord than between Gamma World and D&D. That said, Mutant Future does diverge from Labyrinth Lord in a few places, most notably in that it has no character classes (just like the early editions of Gamma World). Instead, players choose a race from one of five -- pure humans, mutant humans, mutant animals, mutant plants, and androids (of which there are three sub-varieties) -- each of which has their own characteristics, advantages, and disadvantages. There are six ability scores, as in Labyrinth Lord, but Wisdom is replaced by Willpower. Hit points are (largely) static, being based on Constitution (though CON can increase with experience for all races but androids). Oddly, Mutant Future includes a discussion of the threefold alignment system of Law, Chaos, and Neutrality, but I'm a bit baffled as to its purpose in the game, since it doesn't seem to serve either a thematic or mechanical purpose in the game. Mutant characters begin the game with a random number of mutations, each of which is randomly determined from one of several tables. As in Gamma World of old, there are physical, mental, and plant mutations and many of these mutations are in fact drawbacks. As written, there is no attempt whatsoever to ensure that a character's mutations "balance out" in any way, meaning that some characters might, from a mechanical point of view, begin the game with either severe advantages or disadvantages over others. This is of course perfectly in keeping with the game's old school philosophy and it's likely that anyone picking up Mutant Future will see this as a feature rather than a bug. Likewise, my own experience playing the original Gamma World showed that mutational drawbacks were often at least as fun to have as purely advantageous mutations, since they tended to cause trouble for the characters and trouble is the stuff of good gaming. The book includes exhaustive equipment lists, discussions of travel in the wilderness -- very important in post-apocalyptic games! -- guidelines for common physical actions and hiring mercenaries, and figuring out just how to operate and repair the recovered technological devices of the time before the End. These rules, like those in Labyrinth Lord, are not exhaustive, but rather suggestive. They provide the GM (here called the Mutant Lord) with solid examples from which he can extrapolate his own rulings and additions to the game. This approach nicely shows off the strengths of the old school philosophy. Also covered are combat (both physical and mental), saving throws, poison, radiation (including its ability to induce new mutations), and optional rules for ability checks. All of these rules and guidelines take up about 20 pages, a compactness I find refreshing. Mutant Future also provides nearly 50 pages of monsters to face off against your post-holocaust adventurers -- approximately 100 mutants and other foul beasts. Because Gamma World's own bestiary is not Open Content, the vast majority of those presented here are entirely original. Some are familiar D&D monsters re-tasked for life in a science fantasy game. What's interesting is how easily many of these creatures make the transition, reminding us that the border between fantasy and science fantasy is truly an arbitrary one. The game also includes a huge number of ancient technological devices -- the "treasure" of this genre. Once again, these devices are mostly new, although they're all easily recognizable staples of post-apocalyptic gaming. The book concludes with a remarkably good section dedicated to "Mutant Lord Lore," which is to say, GM advice. Although comparatively short, there's a lot of very solid advice packed into these pages about designing both a setting and the adventures that take place within it. Sample traps and other hazards are provided, in addition to a very short adventure locale. There's also a rough outline of a setting in the form of a hex-based wilderness map. Again, it's suggestive rather than exhaustive, but that's a good thing. The final section of Mutant Future includes conversion notes between its rules and Labyrinth Lord, pointing out problem areas and how to reconcile the slightly different mechanical approaches of the two games. As a younger man, I'd have balked at the inclusion of such a thing. Nowadays, though, I am glad for it, because I think genre bending is a key element of old school fantasy gaming. All in all, Mutant Future is a very impressive game. I find it very inspiring and Daniel Proctor and Ryan Denison have given the old school community a huge gift with this product. Firstly, they have preserved not merely a genre that's not seen much play in recent years but also a style. Mutant Future is exuberantly gonzo. That's not to say that it's a "joke" RPG, because I am certain you could run a dramatically compelling campaign using these rules. However, Mutant Future is not a serious examination of the possible effects of a nuclear war on human civilization. It is a fantasy game that uses pseudo-scientific elements to set the stage. The game must be taken for what it is -- "a science fantasy game of mutants, ruins, and radiation," it calls itself. On those terms, it is a resounding success. Secondly, I think the authors have done the old community a favor by pointing another path to revival. Because they had no choice but to create a wholly original game in the spirit of its predecessors, Proctor and Denison have, I think, given us a model of how new games in the old school tradition could be crafted. By my lights, I actually prefer Mutant Future to Labyrinth Lord because it is less strongly anchored in the specifics of its predecessor and thus has a chance to grow and evolve -- no pun intended -- in its own way, free from the baggage of the past. I think many people who aren't otherwise inclined to see the virtues of old school gaming might be willing to judge Mutant Future on its own terms rather than as an ape of an older game. Of course, Mutant Future would have been impossible without the foundation laid by Labyrinth Lord, both mechanically and conceptually. And so, while I think the approach taken by Mutant Future is one I'd prefer to see undertaken more often by old schoolers, it's not really and either/or situation. Instead, we have two sides of the same coin: innovation arising out of preservation -- a motto for the old school renaissance. Mutant Future isn't perfect, but its flaws are so small as to be negligible. If you have any interest in finely and lovingly crafted games in the old school tradition, you owe to yourself to grab a copy of this game. Matt "Mythmere" Finch, one of the minds behind OSRIC, has released the first installment of Swords & Wizardry, a retro-clone of OD&D. As Matt himself notes, this is less of a clone than OSRIC, instead being what he calls a "Rosetta Stone." By this, I take him to mean that his intention is to create a kind of game mechanical "key" by which players of many different versions of D&D and its spin-offs (including clones like OSRIC, Labyrinth Lord, and Basic Fantasy) might be able to communicate with one another and cooperate in the creation of products compatible with their own preferred version of the rules. In this respect, it's very similar to my own recent discussion of a "universal system," albeit a more ambitious one than I'd originally intended. I have only skimmed the first installment so far, but what I have read looks good. I am certain I will have my complaints, nitpicks, and criticisms. However, I am very pleased to see that someone has taken up this project, since I think it's an important one. Matt apparently has a number of plans for Swords & Wizardry, including a PDF support magazine; he'll be laying those plans out during the week and I'll report on them as I learn them. This is exciting news for the old school community. I'm glad to see the release of something like this and hope that it will aid in the production of many original old school products. The fact that it's fully open except for a few trademarked terms is a huge plus in my opinion and should aid the project's goals immensely. I'll probably have more detailed thoughts later. The Origin of the Druid? The Druid whispered, "Come. I know the forests. Follow me -- and they'll never find us. You too, Lycon." Velia's hand was warm in Elak's as they silently trailed Dalan. Like a shadow for all his gross bulk the Druid slipped from tree to tree, taking advantage of every bush and shrub, till at last the noise of pursuit died in the distance. Only then did he pause to wipe the sweat from his ugly face. "No enemy can find a Druid in the forests," he informed the others. "If necessary, our magic can send the trees marching against those who follow." I've always wondered about the origins of the druid class in Dungeons & Dragons, which first appeared in Supplement III to OD&D, Eldritch Wizardry. Many people took Gary Gygax at his word when he claimed that the class was based on the Gallic priests described by Caesar in his De Bello Gallico. I know asked him about this a few months before his death and that was the answer he gave me, although, to be fair, he didn't invest his answer with pontifical authority. What's interesting is that is that Gary shared a co-author credit on Supplement III, with Brian Blume. Blume, along with his brother Kevin and their father Melvin, often play the role of snakes in the Garden in romanticized portrayals of the early history of TSR. It was the Blumes, after all, who sold their controlling shares in the company to Lorraine Williams in 1986 and ushered in what some consider a dark age for TSR. The ins and outs of TSR's financial history are well known and are discussed better elsewhere. Whatever else Brian Blume was, it's frequently been stated that he was as avid a fan of pulp fantasy as Gygax. Likewise, I have heard the claim that Eldritch Wizardry was the most strongly "swords & sorcery" product sold for OD&D. Taken together and combined with my recent reading of Henry Kuttner's Elak of Atlantis (also available from Paizo's Planet Stories line -- no, I am not being paid to shill for them; I do it willingly), I have to wonder if perhaps the D&D druid owes its origin to the character of Dalan from the quote above. In the short story, he demonstrates numerous magical abilities that are close to those of the character class. Likewise, the druids seem to be a secret order whose hierarchy operates outside the control of civilized society, complete hidden rites and the like. The resemblance isn't perfect, of course, but it's striking nonetheless. All the more reason to keep reading this stuff and yet another reason to tip my hat at Paizo for making it so readily available. I'm generally not a big fan of moderating comments or making it difficult for people to comment on my blog entries, since I would like to encourage discussion, even spirited discussion. However, I draw the line at certain things, including (but not limited to) insults and comments bereft of actual commentary. It's perfectly fine to disagree with me or any of the other commenters here. We're all big boys and can defend our intellectual positions if they're criticized. But if you're not interested in discussing and just want to come by to say I'm a stupid old guy who's looking down his nose at you (or some variation thereof), I'm sorry to say I'll delete your comments and not feel a moment's remorse for having done so. I think it's great that this blog gets so many visitors from so many places. According to my web stats, I have over 400 unique visitors a day from every continent (and every state in the US except South Dakota) and that number is climbing. I'm tickled that people actually take the time to read my hastily thought out musings and even more pleased when they take the time to offer praise or criticism of what I've written. At the same time, I will not tolerate the virtual equivalent of drive-by shootings in my comments. There's simply no reason for it. If you dislike what I write enough that all you can say offer is vitriol, I'd prefer you go elsewhere. I don't make a habit of leaving nasty comments on others' blogs and forums if I disagree with them and I'd like to ask that my visitors show me the same courtesy. Consequently, I'm disallowing anonymous posters for the near-future. I'd like to return to the old ways sooner rather than later, but, for whatever reason, over the last few days I've gotten more unpleasant comments than I've gotten since I started the blog and I simply don't want to deal with. My apologies to those of you who are showing me and the other commenters proper respect. ... there was Northwest Smith. Paizo Publishing has collected all of C. L. Moore's Northwest Smith stories under a single cover as part of their excellent Planet Stories line. If you're a fan of pulp science fiction that, according to Fritz Leiber, is part Abraham Merritt, part Robert E. Howard, and part H. P. Lovecraft, you're in for a treat. This is a superb collection and Paizo, particularly Erik Mona, deserve a huge round of applause for making the literary roots of our hobby once again available to a new generation. Nowadays, if you're not happy with the direction Dungeons & Dragons has taken and you're struggling to find a nice, succinct curse word to describe your disgust, "anime" seems as good as any. Of course, "anime" means lots of different things to different people. Some will be pedantic and point out that "anime," like "pulp" isn't really a genre so much as a medium. Others will instead fixate on stylistic matters, equating blue hair -- "You gotta have blue hair" -- and robot boots with "anime." Still others will focus on common tropes and even (more rarely) content, as if the choices made in any single series were definitional. I tend toward pedantry myself, so I have a lot of sympathy for the notion that anime should be viewed more as a medium than as a genre. At the same time, I also realize that a medium can nevertheless become so strongly associated with particular styles, elements, or concepts that it becomes a "quasi-genre." That's why we can in fact meaningfully talk about "pulp" in ways that are reminiscent of discussions of genre. (The same goes for "noir" in my opinion) So, while "anime" may primarily describe the medium of Japanese animation, that medium has, over the years, become so strongly associated with the content expressed through that medium that it's not completely illegitimate to use the term "anime" in a genre-like fashion. My purpose here isn't to lend credence to many of the most outrageous complaints about D&D's having become "too anime" over the years. I don't in fact think that's generally true at all, especially esthetically. In many ways, I think D&D has, over the years, become less like anime than it used to be. What do I mean by that? For me, one of the strongest -- and indeed most compelling -- aspects of anime is its willingness to break the staid conventions of genre. That's why, in nominally "fantasy" anime, you'll see weird "technological" items, anachronistic clothing, and even situations that supposedly don't "fit" into fantasy. And of course most anime, even the most deadly serious ones, include plenty of humor, often of the slapstick variety, as a way to break the tension (in the fine Shakespearean tradition). D&D used to be like this and, as the years have gone on, it's become less so. I know it shocks people when they first read OD&D and see references to John Carter of Mars alongside those from Middle Earth. The same reaction happens when you first learn of Blackmoor and the Temple of the Frog. The prehistory of the Wilderlands setting is just too much for many to bear. I can't count the number of times I've heard gamers complain about the "silliness" of Murlynd and his six-shooters. Even the supposedly stodgy setting of Tékumel has a hobbit in a zoological park and interdimensional forays to Mexico at the time of Pancho Villa. And then there's Arduin, a game so gonzo that it makes Encounter Critical look almost conventional. At some point, probably after the release of Advanced Dungeons & Dragons, D&D started to take itself too seriously and ceased to be "anime" in the sense I'm using the term. Many people will make the claim that "D&D is its own genre" and that's true -- now. Back in the wild west days when the hobby began, that wasn't the case. D&D was never about itself; it wasn't self-referential. Instead, it was a heady brew founded in pulp fantasy, but, like the pulp fantasies themselves, was quite willing to beg, borrow, and steal ideas from any source that was handy if doing so made the game more compelling to the referee and players. You have to remember too that "fantasy," as a distinct genre, only really got off the ground after the publication of OD&D. Prior to that, "fantasy" was regularly lumped together with science fiction in a way many geeks would today find unpalatable. Such hard distinctions were unknown and likely unwanted. In this respect, the original sensibilities of D&D share a great deal in common with those of anime. The willingness to accept that "fantasy" means "anything unreal" is something that was commoner in the early days of the hobby than it is now. Oftentimes, when people wish to claim that such-and-such "doesn't belong" in D&D (or even "isn't D&D"), it's said out of a sense that D&D has an internal coherence that only evolved years after it began. This is why I feel OD&D offers an important corrective to lots of misunderstandings about the games that descended from it. It's hard to read OD&D with unbiased eyes and not see that the people who created it and certainly the people who played it had a very different conception of "fantasy" than do many people who play the game today. I won't go so far as to say they had a better one, because that's a wholly subjective judgment. But there's no denying that, in this respect, D&D today is very different than its origins. By my lights, Dungeons & Dragons used to have more in common with anime than it does now and that's a shame.